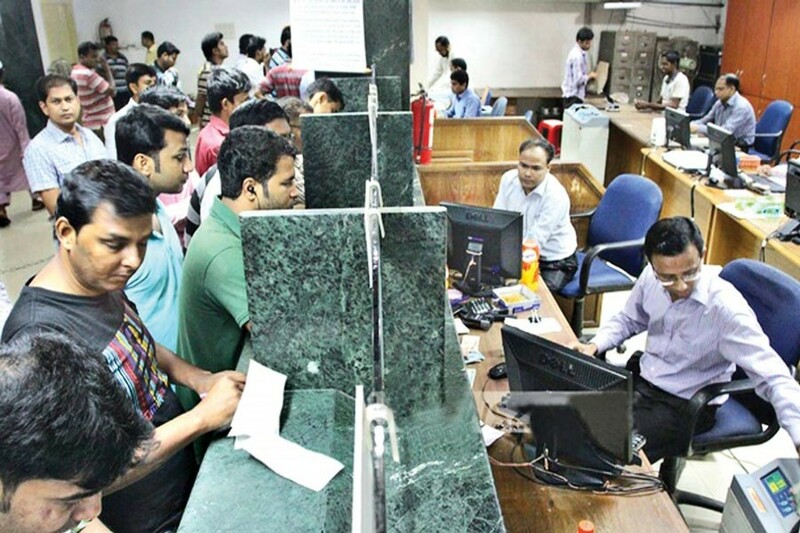 Bangladesh's banking system looks like a carbon copy left by the neo-colonialist Pakistan in 1971. It may be recalled that a few banks owned by private entrepreneurs like Habib Bank Ltd and Muslim Commercial Bank Ltd moved from Mumbai into Pakistan after the partition and formed the nucleus around which the banking sector took a definite shape in Pakistan. A few more commercial banks like National Bank of Pakistan, United Bank Ltd, Standard Bank Ltd. joined the fray at a later stage. Two regional banks -- Eastern Mercantile Bank Ltd. (renamed Pubali Bank Ltd) and Eastern Banking Corporation (renamed Uttara Bank Ltd) were set up in the sixties in what was East Pakistan. After the liberation of Bangladesh, these two banks along with the branches of West Pakistan-based banks were reconstituted through a process of merger into six nationalised banks. For nearly a decade, the newly-created nationalised banks along with a clutch of foreign banks enjoyed monopoly in the area of financial intermediation in Bangladesh. In the early 1980s began the dream run of the private sector to enjoy a slice of the lucrative business of banking. To begin with, two nationalised banks -- Pubali and Uttara -- previously owned by Bangladeshi entrepreneurs -- were reverted to new sets of sponsors in the private sector. The first of the commercial banks set up in the private sector in a joint venture in 1981-82 was Arab Bangladesh Bank Ltd. This was followed by four rounds of bank licencing creating four generations of commercial banks, each corresponding to the period of rule of three main political parties. Political patronage other than integrity, financial soundness and appropriate orientation for running such sophisticated business organisations held sway while giving licences. That largely explains why the regulatory authority -- Bangladesh Bank -- found its going heavy to enforce discipline, accountability, good governance and corporate culture in the banking sector. Inevitably, the financial health of the commercial banks started to deteriorate. To arrest the situation, a massive reform programme was initiated in the 1990s under Financial Sector Reform Programme with the assistance of the World Bank. The reforms aimed at redefining (i) capital adequacy requirement of the banks as per international standard on the basis of recommendation of the BASEL Committee on Banking Supervision focusing on building adequate cushion in the form of risk weighted capital, (ii) loan classification policies conforming to the international standard, and (iii) replacement of Bangladesh Bank's administered bank interest rates on deposits and advances by market determined interest rates. Contrasting spectacles in the banking arena: Banking in Bangladesh presents contrasting spectacles. One is attributed to the state-owned banks (SCBs), and the other to the private sector ones. Over the years the number of these banks has reached 67 and still growing. The avalanche of too many banks has triggered unhealthy competition to secure business in a relatively small market. The business of banking, it seems, has turned into favourite gateway to amass wealth with relative ease and at a greater speed. The contrasts between the SCBs and PCBs manifest themselves in many ways. State-owned banks (SCBs) are poorly run and suffer from bureaucratic rigidities, low output per employee, poor customer services and reluctance to embrace new technology and modern management system. A cursory glance inside the branch of an SCB presents an ungainly sight of rundown furniture crammed haphazardly into overcrowded premises, shabby interior and a long line of people waiting patiently to make a deposit, encash a cheque or pay the utility bill. The ambience appears to be frozen in time. They are run by staff lacking a sense of urgency and without orientation towards customer service. The application for a loans travels from one office to another and takes ages and lots of lobbying and sometimes speed money before a decision is taken. The PCBs suffer from blemishes of different kinds with inside lending occupying the centre stage. However, they have quickly learnt the art of operating in a competitive environment and attract customers with imposing premises in a prime location, richly decorated façade and interior, state of the art equipment and technology. They make their staff work hard, often deep into night, and dispense rewards and punishments on the basis of performance. As mentioned earlier, the scenario does not look any different from the brand of banking that shaped the destiny of a nation called Pakistan before Bangladesh parted its company in 1971. The powerful banks in Pakistan, with their headquarters in Karachi, ruled Pakistan's financial empire and mainly served the West Pakistani businesses. In time the business tycoons grew into legendary twenty two families and played a pivotal role in shaping and reshaping the financial and political landscape of the country. The father of the nation, Bangabandhu Sheik Mujibur Rahman held these banks and the insurance companies responsible for exacerbating the disparity between the poor and rich as well as between the two wings of the country. Bangabandhu, in fact, echoed the sentiments expressed by some famous names. Henry Ford, for instance, thought, "It is well that the people of the nation do not understand our banking and monetary system, for if they did, I believe there would be revolution tomorrow morning". The comments of another gentleman, Sir Josia Stamp, are more scathing: "Banking was conceived in equity and was born in sin. The bankers own the earth, take it away from them, and leave them power to create deposits, and with the flick of a pen they will create enough deposits to buy it back again." It sounds a shade uncharitable for the bankers, but this self-deprecating remark was made by none else than Sir Josia Stamp, the President of the Bank of England in the 1920s and the second richest man in Britain. Old Game, New players: Unfortunately, the banks in Bangladesh too are exactly doing what Bangabandhu detested: enriching the rich and marginalising the poor, especially the rural poor. The banks' resources are by and large pre-empted by borrowers in Dhaka and, to a lesser extent, Chittagong. Together the two cities account for nearly 78 per cent of the bank loans with Dhaka alone pre-empting a lion's share of 60 per cent and Chittagong a distant second with a share of 18 per cent. Most of the loans are taken away by a powerful coterie of elite borrowers close to the owners of the banks. Concentration of bank money in these two metropolises is the prime reason for polarisation between the urban and rural areas. In this scheme of things, the rich are getting richer but the poor find it real hard to climb out of the abyss of poverty. The much-hyped financial inclusion programme for the poor continues to generate rhetoric in the meetings and seminars but remains a distant dream for the poor. The ten taka bank accounts facility introduced by a flamboyant governor of the central bank sounds romantic but does not take the poor any further beyond that ten taka point. Another hyped SME loans programme, by definition, do not benefit the small or even the medium-sized entrepreneurs; the banks have found ways to camouflaging ordinary loans as SME loans to enable the authorities to brag about financial inclusion. A recent Bangladesh Institute of Bank Management (BIBM) study shows that Bangladesh is indeed lagging behind the neighbouring countries in terms of financial and economic inclusion. The banks licenced to serve non-resident Bangladesh nationals maintain studied distance from the expatriate nationals; Islami banks, in spite of exotic names of its products, are hardly distinguishable from the ordinary interest-based commercial banks while the farmers' banks have everything except farmers in its agenda. These egalitarian sounding names apparently are ploys to stake preferential claim for banking licence but the promise to serve a specified category of clientele is forgotten before the 'ink' on the bank licence dries up. In short, Bangladesh looks like the city states of ancient Greece where the ordinary people living beyond the city perimeters did not feature in the development agenda. The GOB seems to have taken a cue from the old Greeks to orient its policies to enrich the capital city of Dhaka where the lion's share of the nation's wealth and power is concentrated. The capital city accounts for almost 40 per cent of the country's GDP. Hardly a day passes before we hear about the fly by night characters swindling one or other bank of hundreds and thousands of crores taka while the financial managers of the country prefer to remain a spectator. To add insult to injury, the swindled money is swiftly siphoned off to Switzerland and other offshore centres, creating pressure on the taka and drying up local capital. All the while the bill for curing the financial illness of the state-owned banks costs billions of tax payers' money. Some of the private sector banks also appear to have been suffering from perennial weakness. The government of Bangladesh, especially the party in power since 2009, has achieved tremendous success to steer the socio- economic development of the country to new heights. The country now aspires to join the club of middle income countries in the near future. However, the banking sector, especially the mammoth white elephant otherwise known as state-owned banks, remains an Achilles heel of the economy. The banking sector has now firmly entrenched in the financial landscape. Their protagonists wield enormous influence in the ways they want to operate in the market. That must not, however, be an excuse to pretend to be happy with the apparent glamour it seems to exude. Focus must be oriented towards revamping the system to dispense the benefits to all the regions and diverse segments of the population to ensure a balanced development of the country to translate the dream of Bangabandhu and millions of martyrs. The following are some of the steps that be taken to cure the malaise afflicting the sector. * There should be targets fixed for each region/division or, if possible, each district for the dispensation of credits equivalent at least to the amount of deposits collected from those locations. The targets may also specify the proportion of funds which, as a minimum, must be used for micro, small and medium enterprises. * The state-owned banks may be split into eight to 10 institutions on the basis of geographical locations roughly corresponding to existing divisions or a cluster of adjacent districts, and sold to the private sector investors for running as regional banks with headquarters in the respective regions. Clear guidelines must be established to ensure that these banks are dedicated to promote business and industries in the respective regions. * Ad-hoc decisions like setting caps on interest rates for lending, strengthening the stranglehold of a few families through induction of larger number of family members in the board of directors may be avoided; it militates against the spirit of dispensation of the benefits of economic development to all sections of the society and regions of the economy. * Greater scrutiny should be exercised to determine the integrity, capability and orientation of the persons chosen for appointment of directors. Independent directors should be appointed by the central bank instead of the banks themselves who end up choosing their favourite ones willing to join the chorus in the board rooms. * The government may set up an independent Banking Commission to look into different aspects and formulate recommendations for the consideration of the Government.